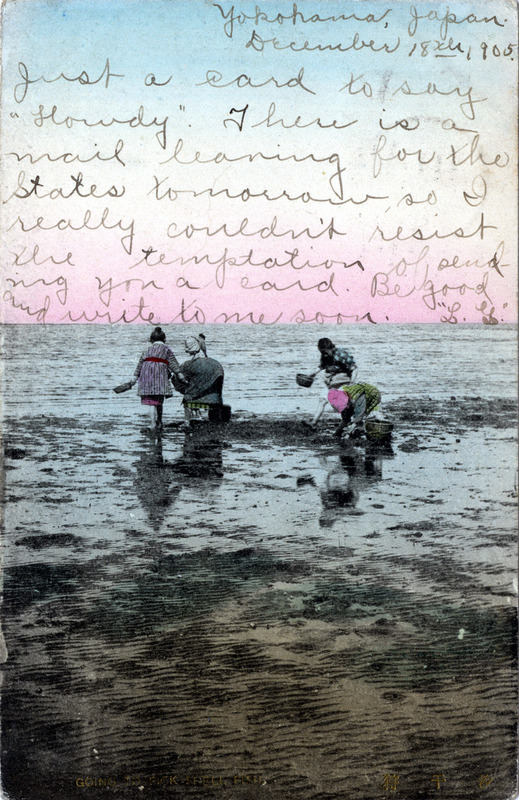 Shell gathering at low tide, Kanagawa, 1905. “The air is like a tonic, though the breeze, gently blowing from the sea, is not free from the chilly remnant of Winter. The sun, shining through that soft and misty atmosphere characteristic of the cherry blossom season, is as warm as eiderdown. “The tide has receded so much that blackish sandy beds are revealed, and there and there are pools of water reflecting the milky clouds or rippling in the red shadow of the Japanese women’s petticoat. Bare-footed or wearing rubber boots, with trousers rolled and kimonos turned up at the knee, the people, flushed with enthusiasm, bend down over the muddy beds, digging here and poking there to gather shell-fish.